International rankings assessing the countries of the region like of Freedom House show them "not free", except Kyrgyzstan, which is "partly free". I would say "partly not free", but what is the difference if the cup is half full or half empty. Those enjoying privileges would say "half full" looking forward to better, though uncertain future. But what people deprived of justice would say? Would they be so generous? This week in the region passed boldly painted with half-measures, half-deeds, half-statements, half-conflict. What does it mean? Kyrgyzstan makes a remarkable step forward towards reintegration with its former communist regimes. It held a presidential election in a way to satisfy both the international observers and soothe its past comrades. As every expert had anticipated, a power party nominee won the race. Or did he? "This is a victory of the administrative resource and comprehensive state propaganda," political analyst Naryn Ayip stressed. "It is also possible to deceive the automatic system of vote counting - it is enough to create such conditions in advance that the desired result will be predetermined. It's like distributing questions to all journalists in advance, and then wondering at the press conference: I do not force anyone, they ask such questions themselves." Hypocrisy has always been a Soviet nomenklatura's most prominent skill. Forgive me, but what to call things when the government praises democratic principles as its highest values and leaving no feasible options in practice. On the other hand, among Western democracies, Kyrgyzstan was a model to influence neighbours with its heroic way to freedom and justice. Nobody in the region liked it, and the pressure was high. As a result, Kyrgyzstan continues to sell itself in the West as the only democratic state in Central Asia. And, yes, an island of lambs surrounded by sharks and wolves. A current leadership of Kyrgyzstan cast its anchor for moral and financial support towards the Kremlin through blood and revolution, and the confidence came at a price. Where and how Kyrgyzstan positions itself? As an adherent to human rights and freedoms or its despotic partners? Speaking on 7 October, at the ceremony of awarding teachers, a little too passionate amid election, Almazbek Atambayev "hit" the head of neighbouring Kazakhstan Nursultan Nazarbayev, for "imposing its candidate." Kazakhstan transferred the border troops to a reinforced regime of service complicating individuals of Kyrgyzstan to cross the border and businesses sell or deliver their goods through or on the territory of Kazakhstan. 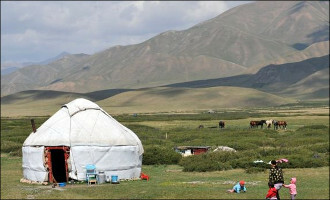 The Government of Kyrgyzstan even complained about the situation. On 18 October, Prime Minister of Kyrgyzstan Isakov flew to Astana to meet his colleague and agreed on reinstating the previous regime on the border favouring Kyrgyz individuals to pass the border. However, the parties did not reach another point significant for Kyrgyzstan as a member of the Eurasian Economic Union - a transit of goods from Kyrgyzstan through Kazakhstan or sale on its territory. At the same time, Kyrgyz President Atambayev admitted he "had wrong" criticising President Nazarbayev, so he stroke an oligarchic milieu of his colleague instead. Strike and retreat. One step forward and step back. Why the Kyrgyz still incumbent president say such things? Emotions amid election? Or was something more sinister hidden in his message? It is not the first time when President Atambayev blatantly blames his colleague. Late President Islam Karimov became his target in 2015 during the celebration of the victory in World War II in Moscow. The Kazakh government is busy with arranging its affairs with former oligarch Mukhtar Ablyazov. Successfully reaching criminal verdicts against the exiled banker and dissident the law enforcement authorities encouraging BTA Bank former staff members to return to Kazakhstan and cooperate with the investigation. In return, the Kazakh authorities are not harsh to returnees. The court in Kazakhstan sentenced Ablyazov in absentia to 20 years of imprisonment with confiscation of property and a fine after they realised it is impossible to extradite him from France. The court convicted three more BTA Bank top managers along with him: each of them to five years' of suspended imprisonment. All these measures are not the same as a capture of Ablyazov, but this half-achievement would have calmed the public in Kazakhstan. Not long ago, post-Karimov Uzbekistan declared it would follow the international obligations to promote human rights and freedoms. The authorities continue releasing imprisoned human rights activists and journalists, though one by one. Meanwhile, the National Security Service of Uzbekistan secretly arrested a prominent journalist Bobomurod Abdullayev, writing for Fergana News as Marsel Idrisov, keeping him incommunicado, depriving of legal defence and refusing his relatives see him. Moreover, the investigation sees the journalist plotted a revolution carrying on the grave tradition of the Karimov regime - torturing and imprisoning everyone whose opinion is opposite to the one of the government. It happened amid the preparations for the OSCE media conference in Tashkent to discuss issues of freedom of the media. President Mirziyoyev also promised there would be no forced labour to pick cotton - Uzbek white "gold" - speaking at the UN General Assembly. He even started reorganising the cotton industry by dismantling the "Uzpahtasanoatexport" holding company - state monopolist in the field of processing and export of raw cotton and its products. The source of Fergana News from Tashkent commenting on this news noted that it has more questions than answers. "Apparently, the authorities want to create a freer cotton market within the country. But why to liquidate "Uzpahtasanoatexport" - it is unclear. It is also unclear what will replace it." At the same day, his government raised fees to pay cotton pickers. Since 17 October, it pays 700 soms ($ 0.08) for one kilogramme of raw cotton handed over. Harvesters working in the fields of Tashkent, Djizzak and Syrdarya regions will reap even more - 800 soms, as well as in Mirishkor, Nishon, Koson and Kasbin districts of Kashkadarya region. In September, all cotton pickers gained 450 soms ($ 0.05) per kg, from 1 October - 500 soms ($ 0.06) per one kg. In 2016, the fee was 285 soms ($ 0.04) per one kg. The Uzbek authorities promised not to force people to collect cotton this year, but they could not keep their words: as ever, many public sector employees and students of colleges who come here fearing dismissal or expelling are in the country's fields. Recently, cotton pickers have travelled to the fields by train. Since the beginning of October, 16,700 cotton pickers from the Fergana region, 1,900 from the Namangan region and 14,900 from the Surkhandarya region of Uzbekistan have arrived in Karakalpakstan, Khorezm and Djizak regions. Cotton pickers are dying without proper medical care in the cotton fields. Next week would apparently show more. Would there be any developments to complete half actions made this week? We endeavour to reveal them.